The iPhone 5 is a hotly anticipated device, with pre-orders hitting the 2 million mark in the first 24 hours of launch, it is all set to be the most sought-after device for this holiday season. Although the announcement of the iPhone 5 brought about quite a bit of criticism from certain people who wanted Apple to introduce an all-new design for the device, a company spokeswoman has already claimed that the interest in the new iPhone is “incredible”. It seems not everyone shares the consumer’s enthusiasm about Apple’s new hardware, with Nokia joining Samsung in taking a sly little dig at the iPhone creators as part of their Twitter-based Switch to Lumia hashtag campaign. It was literally a couple of days ago that Samsung released a print ad that lists the features of the new iPhone 5 and their Galaxy S III device side-by-side, taking the opportunity to have a little bash at Apple by including the tagline “it doesn’t take a genius”. 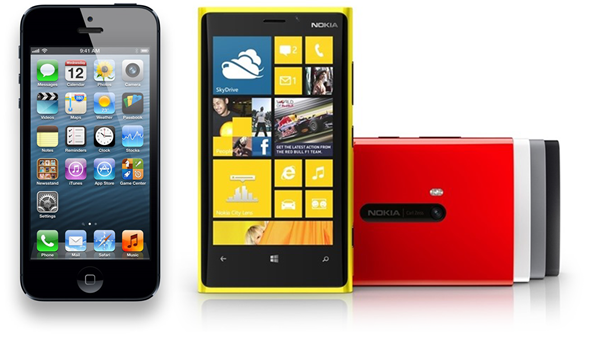 Smartphone fans will already be aware that Nokia has recently held a joint media event with Microsoft to announce their fantastic new Lumia 920 Windows Phone 8 powered device that is looking likely to be a strong competitor for the iPhone 5. The tweet from the official Nokia Twitter account first of all lists some of the more notable Lumia 920 features, such as wireless charging and the advanced camera that ships with the device, but then also goes on to recycle the “it doesn’t take a genius” tagline that was printed as part of the Samsung ad. It’s difficult to work out whether or not Nokia is in actual fact taking aim at Apple and the iPhone 5 in the same way that Samsung has, or if they are taking a rather cheeky little dig at the Korean electronics giants with their tweet. Regardless of their intentions, the Lumia 920 is undoubtedly a fantastic little creation and the fact remains that Apple, Samsung and Nokia all have extremely powerful and capable devices available, which means that consumers will definitely benefit from the strong competition. The only decision to make is whether or not you want to go with iOS, Android or step away from the big two and give Windows Phone 8 a try.